UPDATE August 1, 2018 – Twohey’s Tavern has been rebranded as Foothill. Alhambra’s original historic Route 66 local favorite, Twohey’s restaurant, which recently celebrated its 75th anniversary, has opened an extension of its fare to Pasadena with a re-imagining of classic American food at their new Twohey’s Tavern. The restaurant, although spacious, pristine and monochromatic, instantly feels cozy with smells of broasted chicken, roasted meats, honeyed ham, and braised vegetables—like a holiday return to the gathered family table. A Vermont native, Chef Travis Limoge (Fork in the Road, Mardi at Palihouse) lays a table of fragrant comfort food at it’s best. 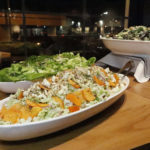 Limoge features such comforting dishes as a Prime 8-ounce Spencer Steak with roasted turnips, crème fraîche, fresh horseradish and orange, and a short rib beef stew simmered with fennel, onion, burnt carrot, served with rye toast, and whole grain mustard. 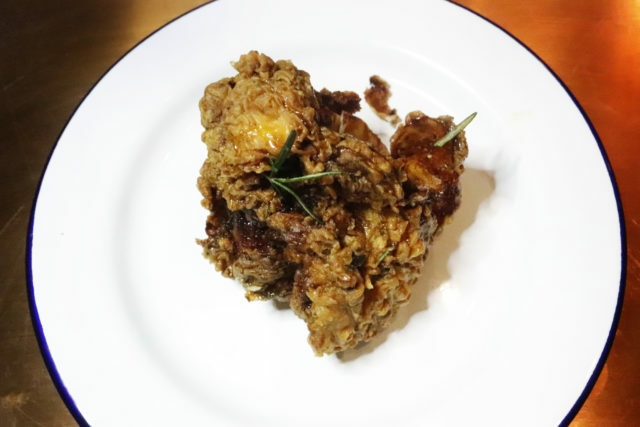 But the highlights are his Fried Chicken—a thick-crusted, tender and well-seasoned no bones half chicken served with braised greens, cranberry beans, and a drizzle of Bill’s Bees wildflower honey and rosemary, and—most especially—the Ham Steak, served with home-made peach preserve, sprouting broccoli, buckwheat honey, and charred orange. The incredibly tender, smoky-sweet ham instantly calls up memories of holidays at home with family, and all the very best of Americana. The ham from local purveyor Peads & Barnetts of Santa Monica, is “brined for 15 days and smoked for 10 hours,” said Limoge. And then it’s drizzled with the honey. Chef Limoge also features on the menu a Channel Island Rockfish from Santa Barbara that’s served with carrot mash, mole verde, and charred fennel, an Irish American Tortellini stuffed with crème fraîche topped with house chili, cured egg yolk, and onion sprouts, and a vegan Roasted Roots—a dish of seasonal roasted root vegetables, green farro wheat, and celeriac purée. Rounding out a full menu are additional salads, including as the Potato Salad made with roast fingerling potatoes, horseradish, orange, crème fraîche, whole grain mustard, sage, and cured egg yolk, and a personal favorite, the crunchy Coleslaw with fennel, persimmon, Napa cabbage, red onion, goat cheese, candied almonds, and cider vinegar—sweet and tangy. Naturally, Greg Mallis and Tanya and Jim Christos, of the family-owned Original Twohey’s, made sure to feature the classic Angus burger it’s famous for. The Twohey’s Tavern dinner menu reflects some of the original 1943 Twohey’s Restaurant menu to include their famous Stinko Burger—the Stinko 2.0—which is so named as it’s piled with caramelized onions, pickles, and their garlic aioli. The Dutch Style, with Napa cabbage coleslaw, and dill aioli and the Americana with American cheese, butter lettuce, onion, and ketchup round out as carryovers to the original’s fans. A new kid is the Chili Dip, a chili burger made with house chili, Grafton cheddar, onion sprouts, and crème fraîche. Just keep your napkin good and handy for all. But where Twohey’s may be your go-to for their classic Angus burgers, so should you also for the House Fries—quarter inch thick fresh cut potatoes, well seasoned and tender-centered, these potatoes are kept crisp and hot in a copper cup and ready for dipping. As a personal favorite, Twohey’s garlic aioli makes a tasty alternative accompaniment to ketchup, just be sure your date agrees or plans to have the Stinko 2.0. Additional sides or bar bites are Twohey’s own crisp French Fried onion rings—again perfect with the garlic or dill aioli—a classic liver & onions appetizer topped with caramelized onions and whole grain mustard, and a Port Wine Cheese appetizer, Chef Limoge’ grandfather’s signature appetizer and a tribute to their family Vermont restaurant, Valleys Steakhouse—which is a perfect pairing with a house red or the Bobbing for Apples cocktail of bourbon, SKYY Honeycrisp apple, cinnamon syrup, apple gomme, lemon, and sparkling wine. 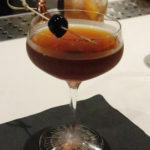 Or the Twohey’s Old Fashioned, which pays tribute to the original Twohey’s with bourbon, Twohey’s Root Beer, and chocolate mole bitters. Additional libations to get cozy at the bar with: The Old Town, comprised of rye, Italian amaro Averna, Lustau Vermut, and bitters, and the Rose Bowl, featuring pisco, gin, rosé syrup, strawberry, egg whites, citrus, and peach bitters. 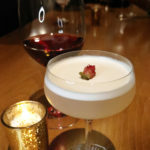 “The Rose Bowl is a nice play on a pisco sour that has complimentary notes between the rose and strawberry,” said Tang. Tang has also created the spicy El Pomelo, made with tequila, Aperol, ancho chile, grapefruit, citrus oleo saccharum, lime, and soda water, the Vixen, featuring vodka, IPA reduction, cucumber, Hawaiian black sea salt, and lime, and the Into the Wild is a crisp refresher featuring mezcal, blueberry-thyme shrub, and lime—just to name a few. Adult beverages aside, the young—and young-at-heart with a sweet tooth—can also come just for the Caramel Chocolate Tart, an upscale Banana Split with homemade banana ice cream and a banana brûlée, the house sundae topped with Twohey’s famous bittersweet fudge, roasted almonds, and whipped cream, the Citrus Pound Cake topped with those peach preserves and homemade basil ice cream, or an Americana classic Jelly Roll served with seasonal preserves and Chantilly cream. And like any good malt shop, there are shakes—including a Peach Shake made once again with the house peach preserves, brown butter, and sage ice cream, a Strawberry Shake, made with basil ice cream, fresh strawberries, and balsamic, and a bacon lovers dream—a sweet and salty Malted Maple Bacon Shake made with bacon ice cream, malted milk, and Vermont maple syrup. Don’t nix that whipped cream! 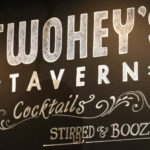 Twohey’s Tavern is open for dinner, and Sunday through Thursday, 5:00 pm to 10:00 pm, with the bar open additionally until 11:00 pm, and Friday and Saturday from 5:00 pm to 11:00 pm with the bar open additionally until midnight. Go to the website or call 626-449-2337 for additional details and info. 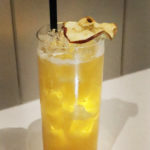 This entry was posted in Cocktails, Beer & Wine, Food and tagged americana, chef travis limoge, fried chicken, los angeles beat, monique lebleu, Pasadena, Rose Bowl, twohey's restaurant, twoheys tavern. Bookmark the permalink. A peach ice cream shake? Why can’t they be open for lunch??? I know, right?! Those peach preserves though. ? This article needs considerable editing. A lot of incorrect word usage and grammatical errors. The restaurant’s menu sounds enticing; however, the prices are quite a bit higher than Twohey’s. Thank you Linda, I appreciate the feedback. Yes, in general the food prices are higher at Twohey’s Tavern than at Twohey’s Alhambra. The fried chicken with braised greens was about $25 and the Channel Island Rockfish with carrot mash and charred fennel was $22 at Twohey’s Tavern. The liver and onions appetizer was $8 and the port wine cheese appetizer was $6. 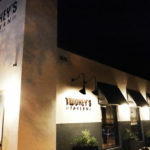 Pasta and specialty items at Twohey’s Alhambra vary anywhere between $16 to $25. I don’t have a price comparison on the burgers between the two restaurants, but there is a chance that having different food vendors, a full liquor license and all that comes with opening a new restaurant in a renovated Pasadena location are likely contributing to differences in price there. Pingback: Twohey’s Take-2: the Route 66 Landmark Makes Landfall in Pasadena – Scoping L.A.
Pingback: Twohey's Take-2: the Route 66 Landmark Makes Landfall in Pasadena ~ Scoping L.A.
Pingback: Pasadena Restaurants Honor Invention of the Cheeseburger in 5th Annual Week-Long Challenge ~ Scoping L.A.